Redefining the piano playing experience. Casio continues to set standards in the industry with the release of the Celviano AP 270 Digital Piano. Featuring Casio's very own innovation and technology, the AP 270 offers unrivalled sound quality and unparalleled sound technology at an incredible price. Unlike any of its kind on the market. Play with the fullest expression with Casio's Tri-sensor Hammer Action. As the three sensors detect your keystrokes, the AP 270 faithfully reproduces your sound continuously. Capturing every nuance of your performance. And thanks to the Chordana App, you can learn while you play. With a range of 60 tracks, Chordana Play generates a music score and a piano roll notation to your song of choice. So you can learn and play with incredible visual aid! Simply connect your smartphone or tablet to your digital piano. Then take the three-step lesson with the virtual onscreen keyboard. Practise your notes, chords and technique with the light-up keys. Casio introduces a new approach to reproducing the string resonance effect, with the multi-dimensional Morphing AiR Sound Source. Incorporating the new string resonance system, the AP 270 is able to reproduce the authentic sound of reverberating strings. The intuitive system distinguishes individual tones while you play. And reproduces the most authentic variations in resonance according to the individual notes you have played. So you can deliver the most unique expressions, with absolute depth and tonal strength. The Celviano triple sensor key feature is receptive to subtle movements in your playing style, by which the AiR source can translate into an acoustic sounding response. While the tone enhancing simulators provide incredible features such as hammer response and damper resonance to further the complexity of your sound. All 88 keys incorporate a stereo resonance simulator that realistically reproduces the string sounds of a grand piano. So you can perform with phenomenal dynamic strength and tonal character. The Celviano series features Casio's Tri-Sensor Scaled Hammer Action II keyboard. Thoughtfully designed to deliver the most natural and authentic playing experience. 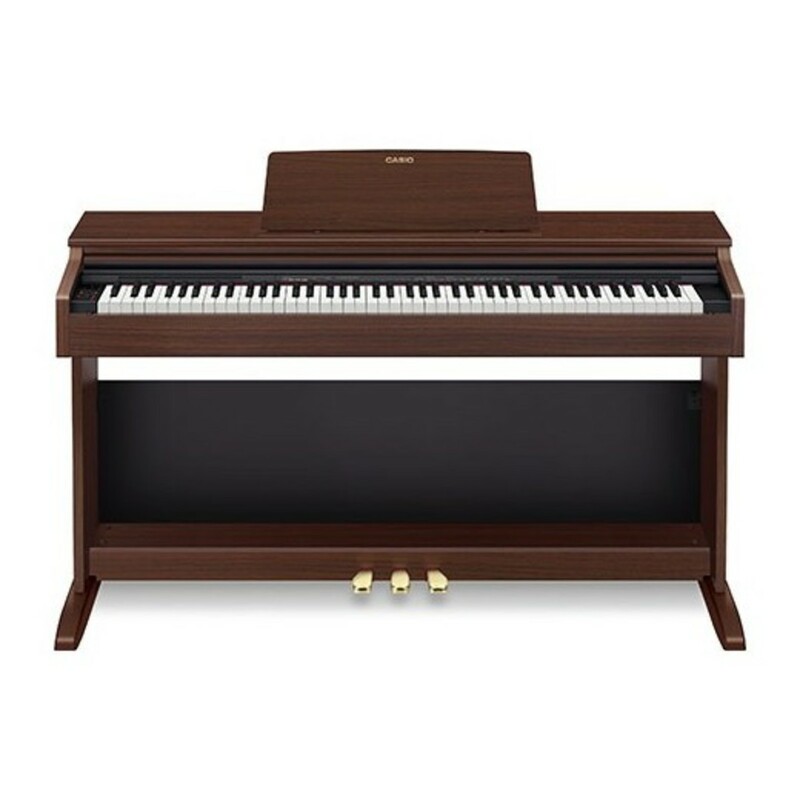 The AP 270 is meticulously engineered to recreate the weight, touch and resistance of a grand piano. Maintaining quality and portability. The digital piano is made with simulated Ebony and Ivory textured keys. Replicating the touch and playability of the acoustic grand piano. And built with an all new tri-sensor system. You can accurately capture the tonal character of your performance with the AP 270. Faithfully reproducing both the speed and accuracy of your performance. Casio’s AP 270 allows you to perform with total depth, character and strength. For quiet listening, the AP 270 now has two headphone outputs which are located on the front of the instrument and for those who are performing with other amplification, the AP 270 also features 1/4" left and right line outputs on the rear panel. 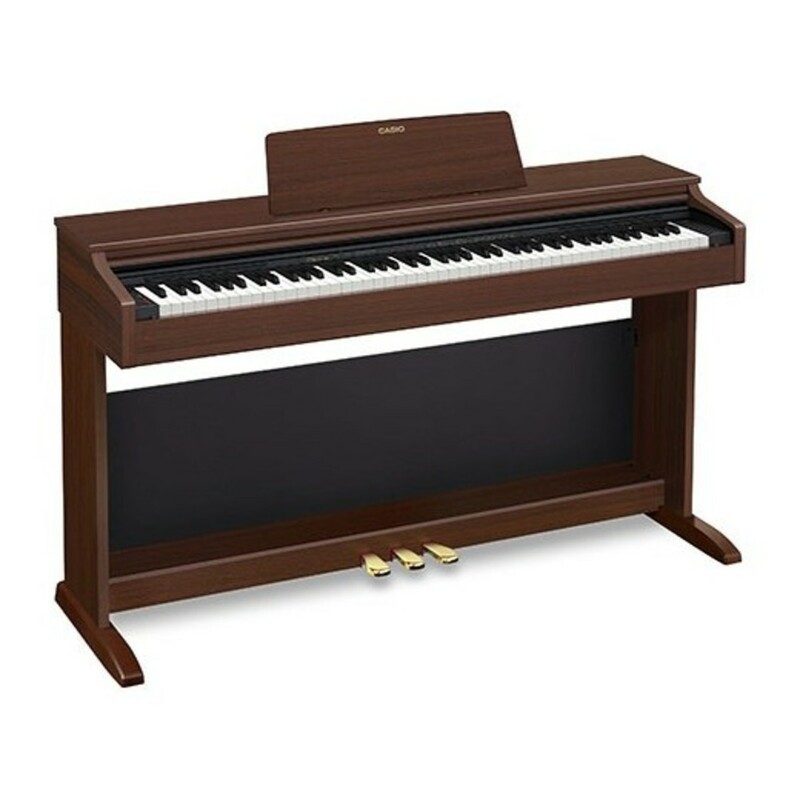 The AP 270 continues Casio’s tradition of providing “class compliant” USB connectivity on Celviano digital pianos. This allows the AP 270 to be used with Mac or Windows computers without the need for downloading drivers. Class Compliant USB MIDI also allows the AP 270 to be used as a controller with the Apple iPad simply with the use of Apple’s Camera Connection Kit. For peace of mind, Casio UK are happy to provide a 5-year warranty on Grand Hybrid Piano and a 3-year warranty on Privia (PX-770 and PX-870 only) and Celviano (AP-270 and AP-470 only) products where a technician will visit your home for any repairs. 3 Years on-site parts and labour for Privia and Celviano products and 5 years for all Grand Hybrids. Please note, these warranties will be valid once registered with CasioUK at https://music.casio.co.uk/warranty/. When you add this product to your shopping basket, you will be provided with our standard courier delivery option. This will deliver the piano to the front door on the ground floor of your house or building. This service will not deliver the piano into your home. *Please note that if there is not a ground floor entrance we may not be able to deliver there. You may also need to help the delivery driver as this product comes packaged in large boxes. This may not be suitable if you are unable to help the driver if required, or if you need the piano delivering upstairs. Please consider whether this is the most appropriate delivery service for you, as other delivery options are available at an additional cost. The delivery personnel will deliver the piano to a ground room floor of your choice, rather than just the front door. Please note that this service will take a few days longer than the standard courier. If you would require a 2 man delivery service, please contact us on 0330 365 4444 for further information. This service can be arranged on an ad-hoc basis via a specialist piano delivery company. Delivery times cannot be guaranteed until we have made arrangements with the delivery company. If you would prefer a delivery and installation service, please contact our sales team on 0330 365 4444 who will be happy to set up a quotation for you and provide you with more information on this service. Any electrical items in your order may have been designed to work with a 240V circuit, using a United Kingdom G type plug connection. An adapter or transformer may be required for these items to work properly and safely in your country. Some items work with a range of voltages, or have a switchable voltage control built in. Please refer to the specific product details for further information.